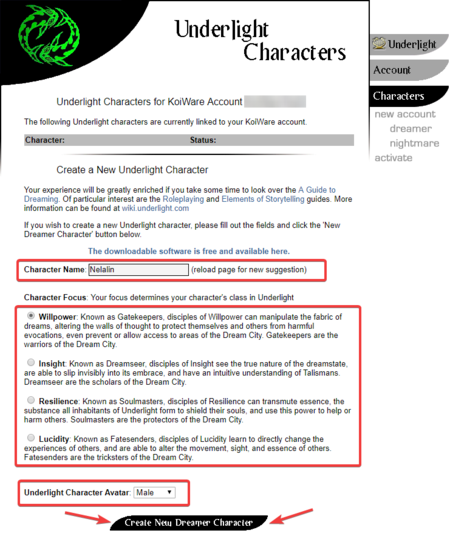 If you haven't yet, browse to https://account.underlight.com/ and either create a new KoiWare account, or login. From there click on the 'Underlight Characters' button. Choose a name, a gender, and a focus. All names are unique. Names are subject to the Three Laws of Underlight and should not offend other players. There are no penalties or bonuses for being male or female in the game. There is another element known as DreamSoul. DreamSoul cannot be a focus. DreamSoul protects the souls of all dreamers from harm. This page was last edited on 1 December 2018, at 00:31.